We've been talking about Do It Yourself Solar and the steps involved. Today let's get down to the brass tacks: system costs. We'll approach it from two directions, component costs and complete system costs. We'll use a 2 kilowatt, grid tied, roof mounted example system where applicable. Let me start out by saying that I do not think its a good idea to go out and try to build a system from individual components yourself. Unless you have experience in electrical work or are already a solar professional, this can over complicate what is already a complicated process. I also get calls from people who have inherited some solar panels or bought an inverter on Ebay. You can certainly cobble a system together with used parts but keep in mind that efficiency is advancing in this industry fast enough that even panels made 4 years ago are behind the times. The best way to start is with new, brand name products. Solar panels vary widely in cost now but are quickly becoming a commodity in terms of pricing. You can find many Chinese manufacturers that will provide panels for $2/watt. But what will you do when you have a warranty issue? Odds are your panel company will be defunct or impossible to reach. I would suggest using a name brand for the panels. In my opinion, Sharp, Sanyo, Mitsubishi, and Kyocera are all excellent panels. Evergreen panels, which are American made, and REC which are made in Norway, are good panels but less prevalent. For these name brand solar panels you can expect to pay anywhere from $3.00 to $4.00 per watt retail. Obviously the more you buy the better your price per watt will be. There are three major inverter companies that do the lion share of solar installations: SMA (the Sunny Boy line is one of the most popular in the world); Fronius (like SMA a German company); and Xantrex (which makes a wide variety of electrical gear). You really can't go wrong with these brands, but of course that means they cost a little more too. For pure sine wave inverters, which is what you'll want for 99% of American homes, you can expect to pay about $2,500 for a 2000 watt inverter. There are many other brands that you can get inverters for closer to $2000 (PV Powered, Outback, and Samlex come to mind) and could be perfectly acceptable for your system. One thing to keep in mind is that since you are connecting to the grid, your utility probably has a list of acceptable inverters. Be sure to check with them before buying ANYTHING. There are so many racking makers and types (eg roof, ground, pole) it seems like every day I learn of a new manufacturer. Generally I don't get too picky about the racking companies. The key part is making sure that you are buying the right racks for the panels and installation type you have. Uni-Rac, Iron Ridge and DPW are all reputable brands and can handle 90% of installation specifications. For a 2000 watt flush roof mount system you can expect to pay about $800-1000 for the rails, mounts and clamps. Ground mount and tilt systems get more expensive because there is just more parts involved. This is a hard part to estimate because it depends on your installation and the distance between the panels and the inverter. One key concept is to realize the larger the distance between the panels and inverter, the larger and more expensive that wire will be. DC power, much like water, must travel through larger wire at higher amperages to maintain efficiency. For a 2000W system I would budget about $400 for a typical wiring, disconnect, fuses, lighting arrestor, and conduit setup. Ok, so that was the hard way to estimate a system. The fact is that companies have recognized that most people want an all-in-one-system (full disclosure: my company sells solar power kits for just this purpose). These kits can be customized for your particle application and come with the parts you need and, most importantly, instructions and drawings! Now this isn't quite like putting together that entertainment center from Target, but with some patience, tools, and a little help from an electrician, these kits are actually very doable. The best part of the kit is the cost. If you do the math on the system talked about before you're looking at about $12,000-$14,000 and you have to match all your components. Kits generally run about $5-$6 per watt. So our 2000 watt example system would be closer to $10,000. And its a complete package, some customers have to add conduit and some wiring, but for the most part its a turn-key system. We touched in micro inverter system before but I wanted to talk about cost quickly. These inverters are meant to be connected directly to one panel of around 230W. 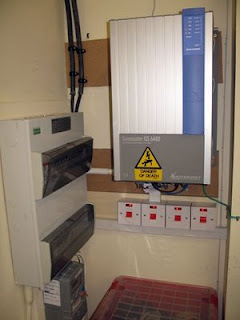 Then the inverter can be connected to the grid. This changes the economics of systems significantly because you can get a 230W panel for around $700, a micro inverter for $230, and a small rack system for $100. Add in some wiring, a fuse and a disconnect and you've just gone solar with grid connection for around $1300. Not bad eh? Next week we'll start the install. Kriss Bergethon lives off the grid with his wife in Colorado. For more information visit his website at Solar Film.